When a tooth is damaged due to decay or trauma, if left untreated, it often results in pain and discomfort. During your regular exam, Dr. Cochran and our office staff are looking for signs of this damage with the goal of minimizing and preventing pain and tooth loss. If damage is found, it can be repaired in a number of ways which are described below. Composite: Commonly referred to as a white filling, this is a tooth colored alternative to traditional metal restorations. These restorations are bonded in place to the tooth to replace areas of decay. They can also be used to enhance the aesthetics of your smile by changing the color and shape of your teeth to correct for cracks, areas of wear, and gaps between teeth (Also see Veneers). To place a composite filling, the tooth is first prepared to remove any decay and to shape the area to better hold the filling material. The tooth is then prepared using an etchant to remove any bacteria and remaining loose tooth particles, providing a good surface to bond to. The cleaned and prepared area is first primed and then an adhesive bonding agent is applied and cured in place. After this adhesive is set, the composite filling material is then placed into the tooth where it is condensed and shaped before being cured. This process of hardening the material is done using safe blue light to solidify the material. Once cured, the material is fully set and the bite can be adjusted to ensure that no high areas are present. The adjusted filling is then polished and is ready for use immediately. Composite fillings can last for many years if good home care is performed, but should also be monitored by the dentist to ensure that the margins (connection between tooth and filling) are still sealed. If signs of ‘leakage’ are detected, it is time to replace the filling to prevent recurrent decay. The indicators that the filling has reached the end of its life include detectable margins and staining or discoloration of the tooth or filling material. Sealant: Sealants utilize the same technology as the above composite fillings. They are a great way to protect against tooth decay and cavities in both children and adults. Molars, teeth in the back of your mouth, are more vulnerable to decay because of their shape and use. The chewing surface of these teeth have multiple cusp tips which are used to grind food. Between these ‘peaks’ are ‘valleys’ which can trap food and bacteria. These pits and fissures are difficult to clean due to the shape and location of the tooth. The first molars come in around the age of five to seven years and are commonly referred to as six-year molars. The second molars come in between the ages of 11 to 14 and are usually referred to as 12-year molars. To prevent decay, it is best to have sealants placed as soon as the tooth has erupted above the tissue. To place a sealant, the tooth is first cleaned and prepared using a etchant to remove any accumulated food and plaque and to provide a good surface to bond to. The sealant material is then placed on the clean tooth in the caries susceptible areas. This is a flowable material and is painted right onto the tooth and has the ability to be drawn deep into the grooves of the tooth. The liquid is cured using safe blue light to create a barrier from food, plaque, and bacteria. Sealants last for about ten years and can be reapplied if necessary. Amalgam: Commonly referred to as a silver filling, this is a more traditional restoration. With a long lifespan, these restorations are good for teeth where larger amounts of decay has to be removed or when replacing another restoration. Amalgam is a good option for teeth that are not in the aesthetic zone or as a lower cost alternative. Similar to composite preparation, the tooth must be shaped to hold onto the filling. Because these fillings do not utilize an adhesive, the shaping of the preparation is key to a successful amalgam filling. The properties of the amalgam material are such that it deters bacterial and plaque growth, however, as with all fillings, proper home care must be used to ensure success. The use of amalgam fillings is indicated when the decay extends into an area where moisture control is not possible to maintain or where strength of either bond or material is not suitable for a white filling. The pros and cons of this type of filling can be discussed with Dr. Cochran if there are any concerns with the use of this material. 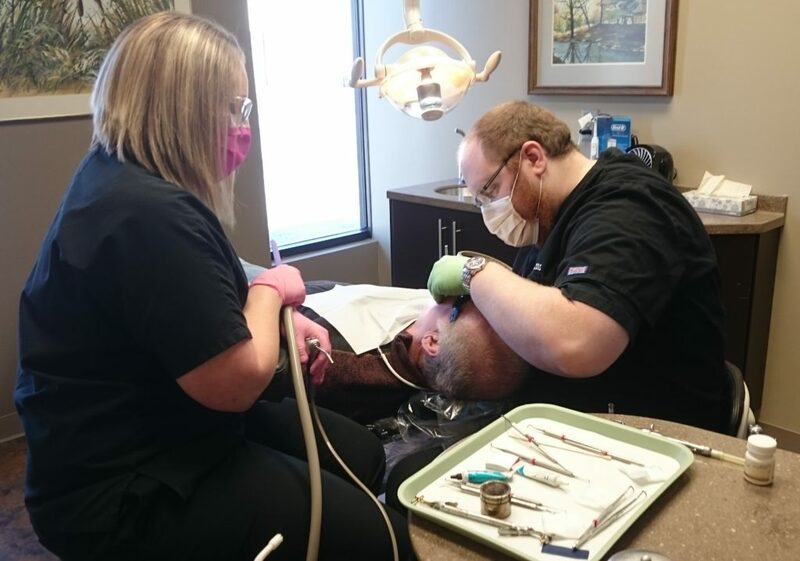 Dr. Garret is preparing an Amalgam filling on Dr. Doug. Amalgam is a proven dental restorative material, in this case this was to replace a filling that Dr. Dan had completed on Dr. Doug when he was still in school, almost 4 decades ago. Inlay: Inlays are an alternative to a restoration that is directly placed in the prepared tooth such as composite or amalgam. Inlays are fabricated in a dental lab of tooth-colored porcelain or pre-cured composite. Inlays can alternatively be made of gold. Once the inlay is fabricated, it is then cemented into the prepared tooth. These types of restorations are commonly used when the damage to the tooth is more extensive, but when the cusps of the tooth are still intact. The restoration is considered an onlay when it is necessary to replace one or more decayed or fractured cusps. Onlay: When a tooth is damaged more extensively than what can be accommodated by any of the above mentioned filling methods, but doesn’t require the complete replacement of the tooth’s outer enamel, an onlay or partial crown can be utilized. This is a more conservative approach than a full coverage crown and can be used when a portion of a tooth is damaged, but the rest of the tooth remains unaffected. Example: Cuspal coverage, half, three quarter, or up to five eighths crown. If damage extends beyond this level, a full coverage crown is indicated. Sometimes referred to as “caps”, a crown is a laboratory-made restoration that replaces the outer enamel portion of a tooth that is lost due to decay or fracture. They are also commonly placed over an endodontically-treated tooth (See Root Canal Therapy) to help prevent fracture of the tooth. Crowns can be fabricated from porcelain, porcelain fused to metal, or full cast metal (example: Gold). Laboratory-fabricated crowns go through many stages before they are returned to the office for cementation and can involve the work of seven or more highly skilled lab technicians to create a custom-made crown to fit specifically on your prepared tooth. Crowns are cemented in place permanently and are cared for the same way as your other teeth. The process of placing a crown takes two to three visits to the dentist. On the first visit, the tooth will be reshaped so that the crown can be placed over it. You will be given a local anesthetic before this part of the procedure so as not to experience any discomfort. Once the tooth has been reshaped, a mold will be taken of the prepared tooth and the surrounding teeth. This impression will be sent to a dental lab so the crown can be fabricated. Before leaving, a temporary crown will be made and placed until your permanent crown is ready. You will also be scheduled for a second appointment to place the crown, it usually takes around two weeks for the lab to return the completed crown. A custom made crown is created specifically for you, to fit onto the prepared tooth and contact the neighboring and opposing teeth. The lab technician is an artist who, using similar methods to a jeweler, will create a tooth that will perform well and be aesthetically pleasing. We can either match the surrounding teeth in shape and/or color or work to improve upon the original if there are cosmetic considerations. There are many types of materials available to be used for fabrication of crowns from gold to tooth colored. To discuss the pros and cons of each, please visit or call our office to find out more. At the second appointment the temporary crown will be removed and your permanent crown will be placed. If any adjustments are needed, they will be made chair side to ensure a perfect fit. If the crown fits to Dr. Cochran’s specifications, we will then cement it in place. After removing any excess cement material and verifying fit and bite, the crown is ready for use. We do suggest that you avoid any hard or sticky foods to ensure that the crown is not moved as the bonding agent finishes setting. Crowns are durable and with good home care will usually last 10 to 15 years but can last much longer. You should care for it as you would any of you other teeth with regular brushing and flossing. Also See “Night Guards” to help protect the occlusal surfaces of the crown and opposing teeth from nocturnal grinding while you sleep. The fabrication of a bridge is a common technique used to fill in the space created by the loss of a tooth. When a tooth is lost, the adjacent and opposing teeth can move into the gap created by the extraction of a tooth. To prevent this, the bridge connects the adjacent teeth (usually one on each side, but sometimes more) and provides opposition to the teeth on the other arch to prevent super-eruption. The teeth that are next to the open space are prepared in much the same manner as individual crowns. These teeth are referred to as abutments and connected together with a tooth-shaped pontic. There are many styles of pontic tooth forms, the correct form is dictated by position in the mouth and patient’s desires ranging from highly aesthetic to easily cleansable (hygienic). The process of placing a bridge takes two to three visits to the dentist. On the first visit, the teeth will be reshaped so that the bridge can be placed over it. You will be given a local anesthetic before this part of the procedure so as not to experience any discomfort. Once the teeth have been reshaped, a mold will be taken of the prepared teeth and the surrounding teeth. This impression will be sent to a dental lab so the bridge can be fabricated. Before leaving, temporary crowns will be made and placed until your permanent bridge is ready. You will also be scheduled for a second appointment to place the bridge, it usually takes around two weeks for the lab to return the completed bridge. A custom made bridge is created specifically for you, to fit onto the prepared teeth and contact the neighboring and opposing teeth. The lab technician is an artist who, using similar methods to a jeweler, will create a bridge that will perform well and be aesthetically pleasing. We can either match the surrounding teeth in shape and/or color or work to improve upon the original if there are cosmetic considerations. There are many types of materials available to be used for fabrication of bridges from gold to tooth colored. To discuss the pros and cons of each, please visit or call our office to find out more. At the second appointment the temporary crowns will be removed and your permanent bridge will be placed. If any adjustments are needed, they will be made chair side to ensure a perfect fit. If the bridge fits to Dr. Cochran’s specifications, we will then cement it in place. After removing any excess cement material and verifying fit and bite, the bridge is ready for use. We do suggest that you avoid any hard or sticky foods to ensure that the bridge does not move as the bonding agent finishes setting. Bridges are durable and with good home care will usually last many years. You should care for it as you would any of your other teeth with regular brushing and flossing, including under the pontic. Also See “Night Guards” to help protect the occlusal surfaces of the bridge and opposing teeth from nocturnal grinding while you sleep. Many of above procedures are considered part of the fixed category. These procedures are partially completed in a dental laboratory and require that a mold (referred to dentally as an “impression”) be taken of the tooth and sent into a dental lab for fabrication of the restoration. Any of the above mentioned restorations can be made from a variety of porcelain materials, metal alloy or a combination thereof. Because each restoration is custom made and involves the work of many skilled artisans this process can take two to three weeks. During this time, a temporary restoration will be made for you at our office to allow for continued use and protection of the involved tooth/teeth. Upon completion of the restoration, this temporary will be removed and the laboratory-fabricated restoration will be placed into your mouth and set with cement. Care of these types of restorations is the same as that of any of your natural teeth. These restorations may take a little while to get used to, but after a few days, it should feel like you have your own teeth back again. A soft food diet should be eaten for the first day or two after having your new crown or bridge placed. After the cement has set, you should be able to eat whatever you want without issue. However, we do caution against chewing on ice and foods that may contain bone chips or other hard items such as small stones or hunting shot. Also avoid biting finger nails or other items that could cause end to end hitting of the front teeth.